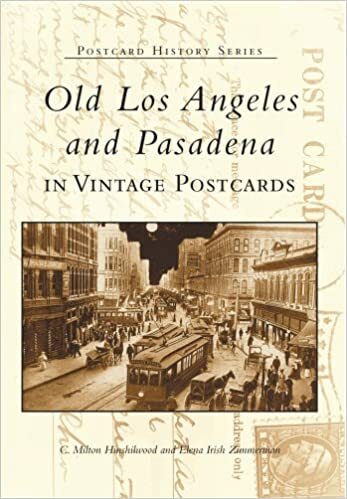 Covering the history and geography of Los Angeles and Pasadena between 1900 and 1950, the collection of over 200 vintage postcards compiled in this new volume offers a unique glimpse into turn-of-the-century southern California. As communication by postcards became popular in the late 19th century, those who received them were offered a rare view of the "right here, right now" aspect that only postcard photography could offer. From the earliest images of the Angels' Flight in Los Angeles, to the Tournament of Roses parades gliding down Colorado Street, the authors celebrate the history of these two beautiful cities through the personal medium of vintage postcards. (Published by Newman Post Card. Co., Los Angeles.) PLAZA IN CHINA CITY. Los AngelesвЂ™ Chinatown used to be located on the present site of the Union Station; it was moved in the 1930s to accommodate the building of the station. Now it flourishes between the 100 and 1000 blocks of North Broadway. It is one of Los AngelesвЂ™ major ethnic communities, containing approximately 10,000 inhabitants. The Chinese first came to Los Angeles during the Gold Rush to work in the mines and to build the railroads.